You are now in the last years of the Viking Era. 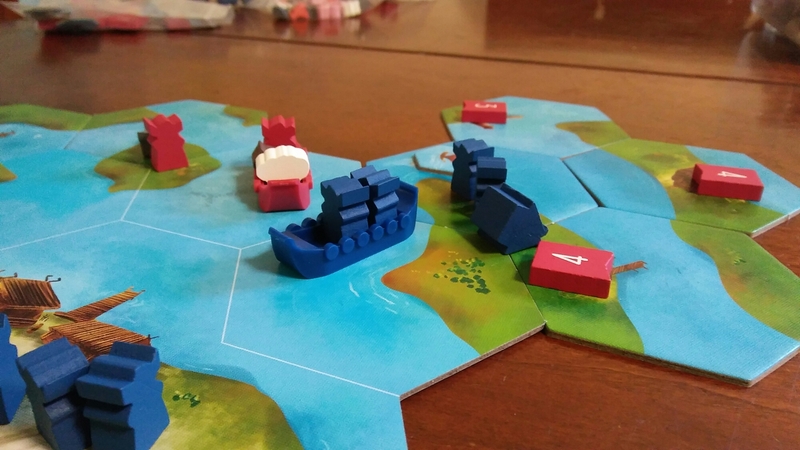 You have built your fleet in Shipwrights of the North Sea, you have then used those ships to raid and plunder nearby opposing vikings in Raiders of the North Sea. You are now ready to venture even further to deeper waters. While exploring the whole of the North Sea you will be overtaking settlements, gathering livestock and destroying enemy ships while expanding your own clan by building settlements. There is a bit of pick-up and deliver, set collection, and area control in this Garphill game designed by Shem Phillips. The player with the most points at the end of the game will be the victor. 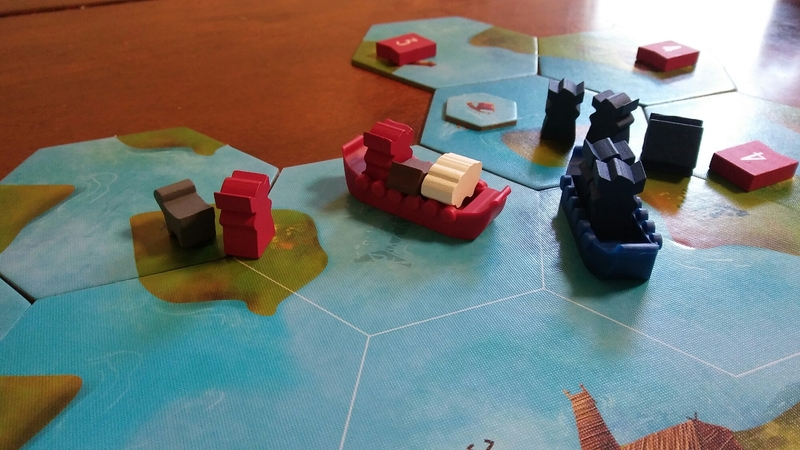 At the beginning of each game, each player will get a boat and Vikings in their color and a player aid. The starting tile will be put on the table with enough room to grow. Each player gets 3 starting tiles and the rest of the tiles are placed in a stack off to the side. You place your boat with 2 Vikings in it on the shore of the starting tile and the rest of your Vikings go on the shore. 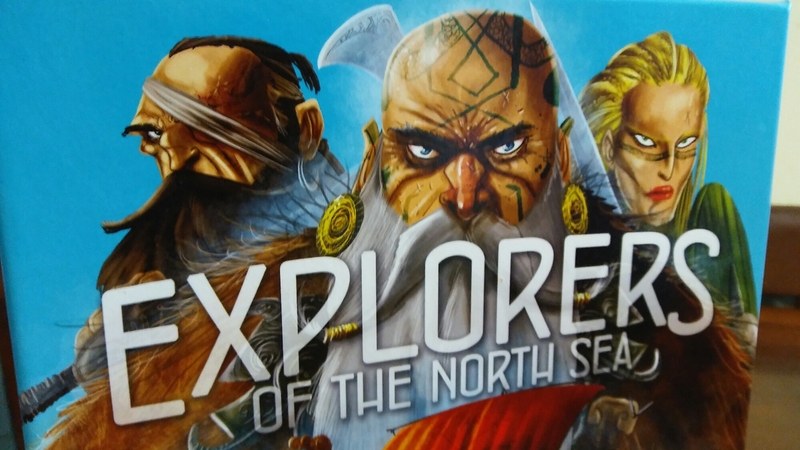 Much like the other North Sea games, your turn in Explorers is very simple. On your turn you will do the following in order…..1. Place one of your tiles to the board. 2. Use 4 Action Points 3. Pick a new tile. There is nothing special when you place tiles. Just like most tile placing games all the terrain needs to match. Water with water, land with land. Depending on what tile you place there may be things added to that tile. If there is one of the livestock symbols on the tile you will place one animeeple on the land. There are 7 different types of livestock. If there is a pirate symbol in the water you take a random Pirate token and place it face down. If there is a settlement, you take a face down flag tile and put it face up on the settlement telling what strength it has. After you place your tile, you take actions. You have many actions to choose from but only have 4 points to use. First is you can move. Each movement costs one action point, that is moving your boat or moving your Vikings. Usually you can move up to 2 meeples on the same tile when on land. Meaning either 2 Vikings or a Viking and a livestock. If you want to move two livestock than you will need 2 Vikings. No more than two livestock can be on the boat….you still need a Viking to steer the boat. There are a couple things that can happen when you move, that do not cost action points. If you are moving with your boat and you go through a spot where there is an enemy ship you destroy that ship. You need 2 Vikings on your ship to destroy it or you can’t go through that tile. On the other side of that ship tile you will see a victory point. There are also some that kill your Vikings. 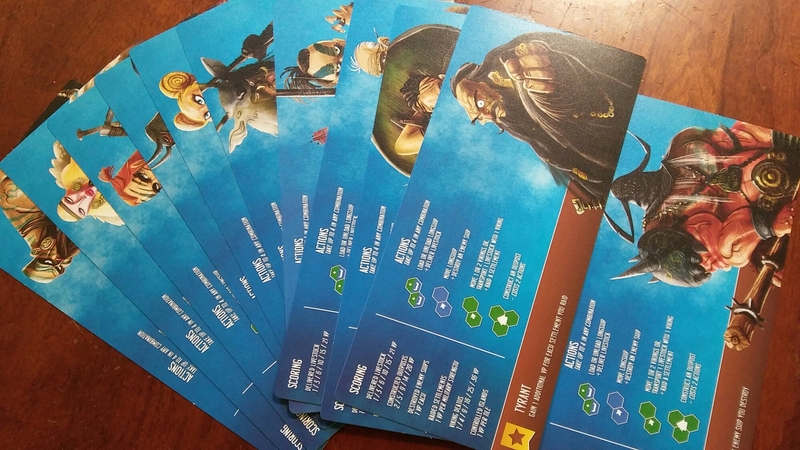 Those Vikings go back to your player board and can’t be used again for the rest of the round. If you are moving your Vikings on land, you may destroy a settlement. The settlements will have a strength assigned to them at random when the tile enters the game. When you destroy a settlement you get those points at the end of the game. To destroy it, you simply need Vikings that are equal to the number of strength. The next action is you can load or unload livestock. This also costs one action point. Your Viking has to be on the land in order for you to load your livestock. That means, you can put your boat right up to the edge of the island, get off your boat, load your livestock and have one more action to move your boat. It might take you a whole turn to get one livestock. The next thing you can do is build an outpost on an island. This is the only action that takes two action points. When you do this you are claiming the island for your own. You need two Vikings to build the outpost also. You place your outpost on the connecting corners of three tiles. From that time forth, no one can now build a settlement that touches the three tiles that my outpost is on. There is a chance for one island to have multiple outposts but it would have to be a big island. You continue to play until the last tile is played and then total your points. You will score points for the settlement tiles you collected, enemy ships you destroyed, collected livestock, killed Vikings, the number of the biggest island that you control, and bonuses from your starting Viking. The player with the most points wins. The componants are pretty good in this game. I love the boats and how everything fits in them nice and neat. It’s fun to load and unload your boats. The different livestock are really nice. I was shocked about how nice and big the tiles are in the game. I guess I was expecting like Suburbia sized tiles, but these are bigger and the art is great. A couple of knocks are the player boards are just card stock, and the art of the livestock are sometimes hard to tell what they are. Horses, goats and cows look very similar. Everything is just fine but nothing to go ga ga over. First player token is pretty awesome! Nothing really stands out in this category. It is all pretty much your standard stuff. There is some really nice strategy in this game. It all starts at the beginning with who you choose as your starting Viking. This will determine what strategy you want to focus on. But there is even strategy on which and when to play what tile where. You could put a tile down with an enemy ship to block off the path of someone who is carrying two livestock, forcing them to either drop one off or go around. You could put a livestock on the opposite side of the map then where someone is that needs it. Or placing that last livestock you need right next to where you are to be able to get it before someone else can get to it. There are some nice decisions to make at this point. But then there are tons of ways to score. Dead Vikings give you plenty of points but handicap you from doing much else if they all die early. Collecting livestock will get you some points but might take you longer. Everything seems to have a good side and a bad side and they all seem to even each other out. The different strategies seem to lend this game to replayablility. All the different Vikings to start with are a nice bonus and can force you to try different strategies. Islands will be different each game. I think it will play much different at different player counts. The two player game was very casual and probably too big??? Over all I can see us playing this game often. We will be keeping this for a while. I absolutely love how quick turns are and how easy it is to understand and play. There are many different strategies and paths to victory. If given a choice, I would probably rather play Raiders but Explorers is a close second. Nothing really stands out individually in this game, it just all works out nicely.